Our First Major Inroad in the MIDDLE EAST is through PAKISTAN! We have our KIMI footprint in at least 21 nations of the world, which includes six continents. 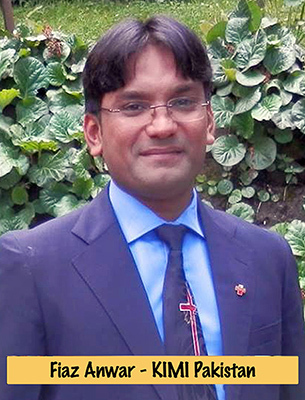 But meeting Fiaz Anwar over Facebook, of all places, created our first significant breakthrough in a Middle Eastern nation–Pakistan. Our US government has strong warnings and travel advisories against American citizens visiting Pakistan, so our chances of personally going there are very slim. That’s where Facebook becomes an incredible tool for us to reach the unreachable. About three years ago a man by the name of Fiaz Anwar began communicating with me over FB. He was desperately hungry to learn more about training children to walk in the supernatural Power of God. So, I took him through our PowerClub training course over Facebook! YES! One video at a time–I would upload. He would download, watch, then take the required tests. PowerClubs in Pakistani Brick Factories! The brick factories are basically places of indentured slavery. Christians, who otherwise find it difficult to find jobs because Muslims are favored, find themselves taking out loans which they will spend the rest of their lives working off in the brick factories. He and his wife has spent months doing this. Finally it was ready to print. We were only able to help him with half of the printing costs, so he raised the other half himself. An now here it is! 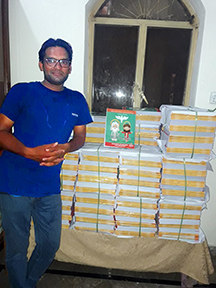 ONE THOUSAND KIMI CURRICULUMS TRANSLATED AND PRINTED IN URDU!!! God has done this thing!!! A place we could never go! But God has his servants everywhere!!! Fiaz will be giving them away all over his nation. As he trains people to do PowerClubs, he now has curriculums to give them when they are trained. This URDU book is FREE. IF you know anyone living and working in Pakistan, or any missionaries that go there, please give them a free copy of this curriculum. Share with as many people as possible! You can download it here: http://buff.ly/2tq9gky. 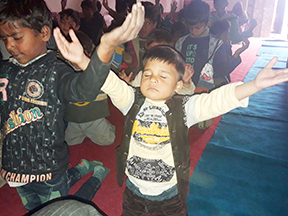 We have carefully watched the ministry of Fiaz and his wife for a three year period, and his willingness to train, study, translate, and produce materials for Kids in Ministry International without ever asking for anything in return, other than occasional help with KIMI associated expenses. We have found him a man of vision, passion for the things of the Lord, and very passionate about bettering the lives of the children of his nation. He is a tireless champion of the gospel Though we may call him a children’s minister, he is without at doubt an apostle and pioneer in his nation. We were proud to place Fiaz in as the director of KIMI Pakistan in 2017. Join Fiaz on Facebook here. 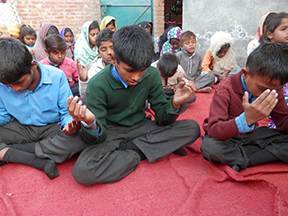 PowerClub children worship in a brick factory and in his church school PowerClub.